These four items appeared separately in the original version of the Around Naples Encyclopedia on the dates indicated. They have been consolidated onto a single page here. I see that the university my wife graduated from here in Naples has started a new degree program in art restoration. That's a good idea in a city with as much art and history as Naples has. The newspapers never tire of reporting how this monument is falling apart or that building is crumbling, and you do notice the small run-down churches, some closed for many years. Yet, much of the time, the city does a good job of using the past. I am referring to the great number of the city's public buildings, universities, hospitals—and even police stations—that are in well-restored monasteries. Obviously, the Protestant Reformation in the early 1500s and the religious slaughter dryly known as the Thirty Years War (1618-48) changed the Roman Catholic monastic tradition that had flourished in Europe since its beginnings under St. Benedict at Monte Cassino in the sixth century. In the 1500s and 1600s thousands of Catholic churches and monasteries were destroyed, put out of business, or converted to Protestantism in England and Central Europe. Those events, however, left the heartland of the Roman Catholic faith, Italy, largely untouched. The Vatican States were left intact and the vast Kingdom of Naples, half of the Italian peninsula, survived the religious strife that had wracked northern Europe. Thus, in the city of Naples in the year 1700, out of a total population of 300,000, fully one-tenth of that number—one out of every ten Neapolitans!—was either a priest, a monk, or a nun living and working in the churches and adjacent monasteries of Naples. That did not change significantly until the French took over the Kingdom in 1806. The anti-clericalism of the French Revolution closed most monasteries in parts of Europe that were under French control between 1795 and 1814; that included the monasteries in Naples, which were closed by Murat's decree of 1812. Monasteries in Naples never recovered from that, even after the restoration of the old social order by the Congress of Vienna in 1815. Later, the second great "suppression" of monasteries in Italy occurred in 1864, after the unification of Italy. Thus, in Naples, though there are still some true working monasteries left, such as Santa Chiara, San Gregorio Armeno, and Camaldoli, most of the grand old monasteries now serve other purposes, and it is interesting to look at a few of these. Various departments of the University of Naples have taken over a number of former religious facilities. The Medical School sits on the height at the old northwest corner of the city, above today's Archaeological Museum and Piazza Cavour. That university department has incorporated a number of smaller churches and cloisters that themselves were on the sites of ancient Greek buildings. Also, the recently restored Cloister of Saints Marcellino and Festo now houses the Paleontology Department (click here). The university library, itself, is behind the modern university building and is on the premises of the old Chiostro (Cloister) del Salvatore, an immense structure built in the 1570s that runs all the way up the hill behind the university almost to Piazza San Domenico Maggiore. It is still a tourist attraction because of its so-called "courtyard of statues", a display of busts of illustrious persons such as Bruno, Vico, and Aquinas. The massive building that now houses the State Archives was originally the Benedictine monastery of Saints Severino and Sossio (photo, right) and is in the heart of the old city, near the intersection of Via dei Librai ("Spaccanapoli") and Via Duomo. The monastery was one of the largest in the city and also one of the oldest, dating back to the 10th century. It was also known as the "cloister of the plane tree" as legend has it that the original building was erected in a grove of trees of that species (platanus), a specimen of which had been given to St. Benedict, himself. (See this separate link, as well.) The history of the first few centuries of the monastery at different premises (the so-called Lucullan Monastery from the fifth century) remains obscure; true enlargement of the premises started in the 1400s. Within the modern building are to be found works of art depicting the history of the Benedictine order. 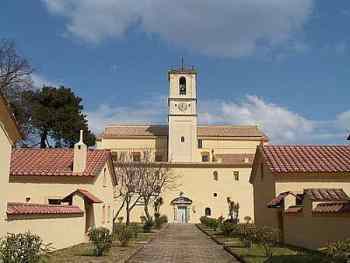 Also, the Music Conservatory, the military barracks at Monteoliveto, the School for Architectural Restoration, and the Monastery of Piedigrotta are other examples of religious institutions converted to other use, mostly in the last 100 years. The list is, indeed, long. Perhaps we do well to look at the gradual conversion of monasteries to other uses not so much as the result of forced closures, although that, too, did happen. It is also a sign of the changing times. "Personal" monasticism—that is, individuals going on religious retreats once in a while to get away from it all—has become somewhat fashionable recently, but there is no doubt that large, full-time monastic orders are an anachronism, witness the long decline in those willing to enter upon religious callings such as the priesthood. Very practical matters, as well, play a part—modern urbanization, for example. 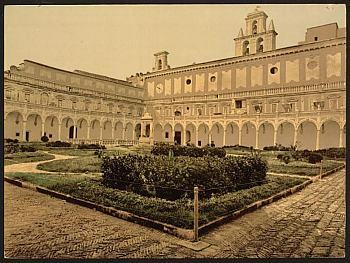 Some of the monasteries built in the 1500s in Naples were, at the time, on the outskirts of the city. The church of the Spirito Santo, mentioned above, was outside the city wall and at the foot of a bucolic hillside. Today, it is in downtown Naples. Even more dramatic is an institution such as the Cloister of Suor Orsola, a convent built in the mid-1600s halfway up the hill to San Martino at the top. When Suor Orsola was built, there was scarcely a trail, much less a road on the hillside. It was in the country. That section of Naples was opened to urbanization by the construction in the mid-1800s of what has become one of the main thoroughfares of the city, Corso Vittorio Emanuele. 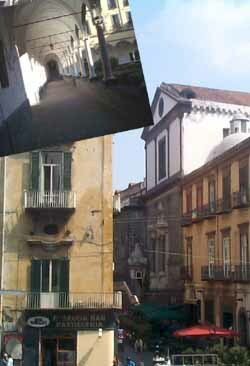 After 1901, the old convent functioned as a women's college and [update: 2010] recently has become part of the Naples university system, with both male and female students. There are still a number of monasteries and convents in Naples, places of seclusion that will take you as a paying guest for a few days and let you seek your Self. One of the most tempting of such places is the Hermitage of Camaldoli (photo, left). It sits on the hill in back of Naples between Vesuvius and the Flegrean Fields at almost 500 meters, the highest point in the area. Even if you don't find your Self, you may at least find some respite from the summer heat. There has been a Christian place of worship on that site since the late 5th century, the original church having been founded, according to tradition, by St. Gaudioso. The structure that one sees today, however, is more recent by a millennium. It is from 1585 and was built by the Camaldolese order, a Benedictine monastic order founded in Tuscany in 1225 by St. Romuald. The architect was Domenico Fontana. The current state of the premises is very fine, and the inside of the church has been restored to its Baroque brilliance. The large altar is attributed to Cosimo Fanzago, and there are numerous prized works of art in the church: sculpture by Salvatore Franco, frescoes by Angelo Mozzillo, and paintings by such artists as Cesare Fracanzano (The Assumption of the Virgin and the Saints) and Luca Giordano (The Holy Family with our Heavenly Father) as well as Massimo Stanzione's version of The Last Supper. The general layout of the hermitage is the result of a major restoration in 1792. "Camaldoli" in Naples is now a place name. We all call that hill behind the city "Camaldoli" and that is the name on all the maps and street signs. The toponym has absorbed its history, so to speak—it used to be a hermitage for the Camaldolese religious order; thus, the area around the site is still Camaldoli even though this particular site is now in the hands of a different order. Indeed, there are many 'Camaldolis' in the world. The original Camaldoli hermitage founded by Romuald is today part of the town of Poppi, in Tuscany. It can still be visited. Legend says that Romuald rested near Fontebuona in Tuscany and fell asleep not far from Casa Maldolo (residence of one count Maldolo). Romuald dreamt of living the monastic life and asked for guidance from Elambert, bishop of Arezzo, who encouraged him and sent him back to count Maldolo where he had had the dream. 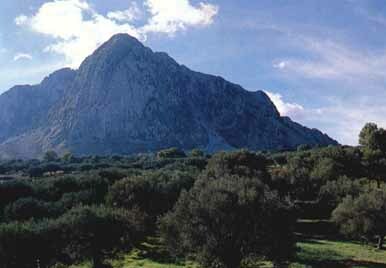 Maldolo was generous enough to donate property for Romuald to found a hermitage. Thus the name Camaldoli is a combination of Casa and Maldolo. The name has survived over a thousand years in many places around the world. At one time in the early 1600s there were a number of 'Camaldolis' (that is, hermitages of the Camaldolese Order) in the Campania area of Italy—in Naples, Salerno, Torre del Greco, etc. One of them is shown in the image (above). It is Camaldoli of Visciano (near Nola), incorporating the church of Santa Maria degli Angeli (of the angels) (pictured). It is on the way from Naples to Avellino, atop Monte Corona, just past Nola and before you enter the bounds of the Partenio National Park. Monastic life, of course, is not what it used to be. Under Napoleon and then after the unification of Italy, monasteries and convents in Italy were closed or at least went through decades of change, a kind of forced secularization. Today, many are again active centers of religious activity, community life, and social involvement. Camaldoli of Visciano advertises that it is always open to visitors; it pursues educational and agricultural programs, and the site hosts meetings and takes paying guests who want to stay a while. (So does Camaldoli in Naples.) And who wouldn't? Like other monasteries in Europe under Napoleon's control (Naples was ruled by the French for 10 years; see Murat), the Camaldoli Hermitage was closed during that period in the early 1800s. It was reopened after the restoration of the Bourbons to the throne of Naples and then closed again in 1866 after the unification of Italy. In 1885 it was again opened and returned to the Benedictine Camaldolese order. That order left the hermitage in the late 1990s, and since that time the site has been the home to sisters of the Bridgettine Order, an order of nuns originally and still commonly known as the order of the Most Holy Saviour of Saint Bridget--in Italian, Santa Brigida. The original order was founded in Sweden by St. Bridget of Sweden (or Vadstena) (Birgitta Birgersdottir) (1303-1373), one of the best-known of all Swedish religious figures, proclaimed a saint by Pope Boniface Boniface IX in 1391. Santa Brigida is otherwise well-known in Neapolitan history, and there is a prominent church of Santa Brigida in the city. She is said to have spent two years in Naples (1365-67) on a pilgrimage that eventually led her to Jerusalem. The modern Bridgettine order has about 800 nuns divided into various branches with over 50 religious homes that double as guest houses in Europe, the United States, Mexico, Cuba, Israel, the Philippines, India and Indonesia. The largest of these branches is the Swedish branch, the one that runs the Camaldoli premises in Naples. 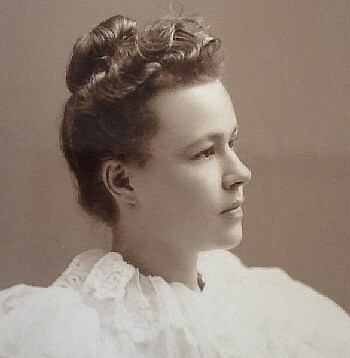 The Swedish branch was founded (re-founded, really) in 1911 by Mary Elizabeth Hesselblad (1870-1957. Photo, right, is from 1897). She was a Swedish nurse known for her benevolent works and attempts at interfaith dialogue; she was beatified by Pope John Paul II in the year 2000. She was recognized by Israel in 2004 as one of the "Righteous Among the Nations" for her work in helping Jews during World War II. Hesselblad was known as "the second Bridgette" and figures prominently in the Camaldoli convent's presentation of itself to visitors. (In Italy, besides the center at Camaldoli, the order runs three centers in Rome--including the mother center, St. Bridget's House--one in Farfa Sabina in northern Lazio and one in Assisi.) The current head of the Bridgettine Order (since 1981) is Maria Tekla Famiglietti (born in 1938 in the village of Sturno near Naples). The entire premises, including works of art within the church, have been recently restored; the grounds are clean and lovely with ample gardens and a breathtaking panorama of the entire gulf of Naples, a reminder that for many centuries before the Camaldolese moved in and informally gave the name of their order to the entire hillside, the summit was simply called the "Prospetto"--the view. As noted above, the convent welcomes guests. The original monastery and home of the Franciscan order that inhabits the church of Santa Maria La Nova was where the present-day Castel Nuovo, or Maschio Angioino, stands. In 1279 the order ceded that property to Charles of Anjou for his new royal palace and, in return, got the new site for their church. Thus the name “Nova” (new) for this house of worship with the elegant Renaissance façade. The original ‘new’ church, then, was built in the late 1200s. That original Angevin building was removed in 1596 to make way for a new structure planned and built by Giovan Cola di Franco. It is the church you see today as you start into the old center of town via a small side-street (photo) off of via Monteoliveto across from the east side of the main post office. The main altar is from 1633 and was designed by Cosimo Fanzago. The most spectacular work of art within the church—indeed, one of the most spectacular in the entire city—is the magnificent 46-panel gilded fresco on the ceiling (photo, right). The fresco dates back to 1600 and is the collective work of a number of artists, including Luca Giordano. Various magnifying mirrors are set up at ground level within the church to enable visitors to view the ceiling more easily. The church, itself, is an integral part of the whole monastic complex, much of which now houses municipal office space. Santa Maria la Nova was closed in 1980 due to damage caused by the earthquake in that year; it was reopened in 1992 for a few years, at which time visitors had the opportunity to view the splendid magnificent interior of the church. It was closed in 1997 for repairs to the building and, in particular, to restore the ceiling fresco. It will reopen on Jan. 4 with an orchestral and choir concert that will be taped for later broadcast by the Italian national television network. This will mark the beginning of what everyone hopes will be a prosperous future for the building and adjacent monastery. The church will no longer be a house of worship. “There are enough churches in this area to handle the demand,” says Father Giuseppe Reale of the resident Franciscan order. Santa Maria La Nova will be transformed into a Center for Sacred Music; the acoustics are already known to be outstanding, and the church organs are fine instruments and have been restored. Most interesting—this is where the “prosperous” part comes in—is the plan to turn part of the monastery, itself (photo), into a four-star hotel! This will be the second such Franciscan venture into the hotel business in Naples. The San Francesco al Monte hotel on the Corso Vittorio Emanuele, overlooking the whole city of Naples and with a direct view of Mt. Vesuvius and the Sorrentine peninsula, has been open for a few months and seems to be doing well. The Santa Maria La Nova hotel with “monastic style” furnishings (for those who wish to engage in some 4-star meditation) with easy access to the auditorium of the Center for Sacred Music) should be open in 2003. Cilento and Vallo di Diano National Park. Naples is the name of the city as well as of the larger administrative unit—the province—of which it is the capital. The province is, in turn, part of the yet larger unit—the region—of Campania. The province of Naples is not the largest in area in the Campania region, however. That distinction goes to the neighboring province of Salerno to the south. 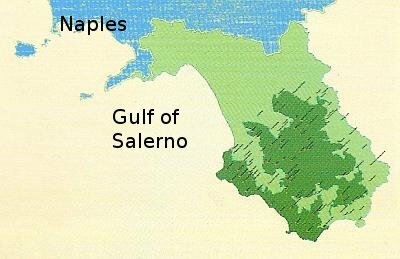 The province of Salerno occupies about 3,000 square miles. About one-third of that area has been given over since 1991 to the Cilento and Vallo di Diano National Park, an area of great natural beauty and extreme historic interest. The park is almost all mountains and starts just below Battipaglia, running down to Sapri on the coast at the end of the Campania region. The bulk of the park occupies the rugged terrain called "Cilento," a bulge on the coast that accommodates a section of the Apennine mountain range that has wandered over from the main line to drop off into the Tyrrhenian Sea. That spur of coast separates the Gulf of Salerno to the north from the Gulf of Policastro in the south. Although the mountains are not high by the absolute standards of the Alps (Monte Cervati at 1900 meters—5700 feet—is the highest summit in the Cilento), the relative height is impressive, especially near the coast, where the immediate change in altitude is from sea-level to the 1200 meters (3600 feet) of Monte Bulgheria, a mountain that rises immediately from the coast above and behind the town of Scario. It is this section of the Cilento that provides some fascinating glimpses into the history of Christianity. If you stand in the little harbor of Scario, you look up at Monte Bulgheria (photo, right)—an archaic Italian spelling for "Bulgaria"—Bulgarian Mountain. It is in the middle of southern Italy but is so-called because the area was settled by refugee monks from the east over 1000 years ago. The great Iconoclast controversies of the 8th and 9th centuries drove a number of monks to escape the severe persecutions of Constantinople (indeed, the most severe of the "icon smashers" aimed to destroy monasticism, itself). The monasteries founded in the immediate area of Monte Bulgheria are Santa Maria di Pattano, San Giovanni Battista, San Marcurio di Roccagloriosa, Santa Maria di Centola, San Nazario di Cuccaro, Santa Maria di Grottaferrata in Rofrano, Santa Cecilia di Eremiti, San Cono di Camerota and San Pietro di Licusati. All of them were founded between 750 and 950 a.d. The southern Italian peninsula of the 700s and 800s was not a bad place for people looking to be left alone. There were long periods when sections of the south were under only the nominal control of a central authority. The Lombards had invaded Italy late in the late 500s. In 800, they were replaced by Charlemagne, the first Holy Roman Emperor, but even that affected mostly central and northern Italy. In the 800s and 900s the south stayed Lombard. First, it was the large Duchy of Benevento; then, that splintered through civil war into smaller units, one of which was the Duchy of Salerno. All of this was then gobbled up in the 1000s by the Normans. Important for this brief discussion is that Lombards, Salernitans, Normans— whatever—were all devout followers of the western church. Yet, followers of the eastern Greek church were, to my knowledge, pretty much left alone to worship as they pleased, even after the schismatic movements from Constantinople, first by Photius in 867, and, finally, the schism in 1054 that officially separated Christianity into east and west. There was not then—nor has there ever been in southern Italy—any particular persecution of the Greek Orthodox religion by Roman Catholics. It is true, however, that, little by little over the centuries, these eastern religious orders in southern Italy became westernized and in many cases were simply absorbed into the mainstream of the western monastic tradition.